Many people do not understand how valuable e-mails are. When management attempts to measure the importance of e-mails to the organization, they typically look at the revenue generated in the shopping carts of the e-mails. It comes to about 3% of total revenue. Nice revenue, but nothing to write home about. They are really missing a lot. E-mail subscribers do all of these things. The fact of the matter is that the revenue from the off-line sales due to an e-mail are usually several times the revenue in the e-mail’s shopping cart itself. If you are going to determine what sales your e-mails are generating, you have to include an off-e-mail multiplier to get the full effect of the e-mail. This was a really great study. Notice that the response rate goes up from the bottom to the top. Direct mail works better than e-mail – but costs about 100 times as much. Direct mail and e-mail together beat everything. From this study, how can we calculate the off-e-mail multiplier? The answer comes from the last two numbers in the third row (E-mail only). From the e-mails sent, 21% of the sales were online – from the e-mail shopping cart or from the website. 79% of the sales came in the store. Simply divide 21% into 79% and you get 3.76. That is the off-e-mail multiplier. It tells you that to determine the non-e-mail revenue generated by an e-mail – for this chain of stores at least, you multiply the e-mail shopping cart sales by 3.76 to get the off line sales due to the e-mail. I worked with several other data sources to determine the off-e-mail multiplier in other retailers and other industries. Every time I got a number similar to 3.76, but often much higher. Why should it be higher? Because, if you study the chart you will see that the last column (% sales online) adds together sales in the e-mail shopping carts and sales on the website. Of course, most of the people who got the e-mail bought in the e-mail shopping cart – but not all of them. Some of them thought about it, discussed it with their spouse, and then went on the website to buy. This means that the percent purchased in the e-mail shopping cart was less than 21%, which means that the off-e-mail multiplier was higher than 3.76. Every time you lose a subscriber, through unsubscribe or a hard bounce, you have lost $26. Knowing this amount, you can afford to spend money to acquire more subscribers. If, for example, you pay your catalog reps $5.00 to get the e-mail addresses whenever someone calls to order something from the catalog, you are making a profit of $21 on every e-mail acquired. If your e-mail marketing manager wants to add a couple of creative e-mail people to create better e-mails which will increase the open and click rates of his e-mails, he can prove that the costs are justified by the way that the better e-mails increase the LTV. The sales generated by the e-mails are not 3% of total sales, but more like 11.28% (3 x 3.76). Any marketing effort that can prove that they account for more than 11% of total sales is nothing to be ignored – particularly when the cost of sending e-mails is so low in comparison with the costs of direct mail, print, or TV advertising. Any e-mail marketing operation that has not yet computed their Off-e-mail Multiplier had better get busy and figure out what it is right now. Arthur Middleton Hughes, vice president of The Database Marketing Institute, has presented 28 seminars on database and email marketing. 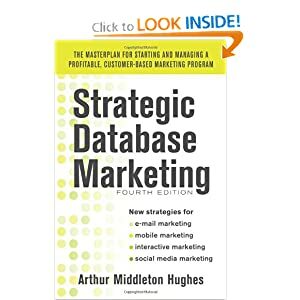 Arthur has also authored several books including Strategic Database Marketing 4th Edition (McGraw-Hill 2012). He and Andrew Kordek, chief strategist and co-founder of Trendline Interactive, are hosting a two-day Email Strategy Study Group in Fort Lauderdale March 26-27, 2013, featuring group competition for email marketers responsible for subscriber acquisition, lifetime value, ratings and reviews, boosting their email budget, and doubling their ROI. To learn how to attend the Study Group,click here.